Some people have great skill and soil as well as the time and patience to grow beautiful gardens year-round. The rest of us need some help here and there. If you’re just starting out, don’t have the magical “green thumb,” or simply need some tips and tricks to make your yard bloom, read ahead for our 45 sure-fire tricks. Even if you’re a pro, we’re betting there are some tips you’ve never heard of here. From sustainable practices to changing the pH of your soil, these hacks will get your garden growing in no time. We get the temptation. This is your year. You’re finally going to grow that beautiful vegetable garden you’ve always wanted. You head to the store and buy everything you can get your hands on thinking that a little water and attention is all you need to make a garden thrive. And hey, maybe it’ll work, but there’s no denying that, more often than not, biting off more than you can chew is a recipe for failure. If you’re not a pro yet, it’s best to start small. Do some research and pick one or two things you’d like to try to grow this year. Pay attention to the timing and the kind of soil and care they need. Don’t overwhelm yourself right off the bat. Grab a few tomato plants, or plant some lettuce seeds and see how it goes. Then you’ve got experience under your belt for next year when you can add some other favorites to the mix. Once you’ve had some gardening success, let yourself get adventurous by planting more and adding some flowers or other fruits and vegetables to your burgeoning garden. Do some research on what can be planted together. If you’ve had particularly good luck with growing a certain type of food, start experimenting with new recipes or trading food with friends who are growing their own specialties. Becoming a great gardener means taking it step-by-step but always challenging yourself to try something new. If you live in an apartment or you don’t have the right soil for your growing needs, consider container gardening. Containers come in all different sizes (from small pots to large Rubbermaid totes) and can be used for fruits, vegetables, and flowers. Containers also have the added benefit of being portable, so if you don’t have the right light throughout the day, you can move things around to keep your plants in the conditions they need. Plants need fertilized soil to grow strong and healthy and produce buds. That means your soil needs to have proper levels of things like nitrogen, phosphorus, potassium, and calcium. 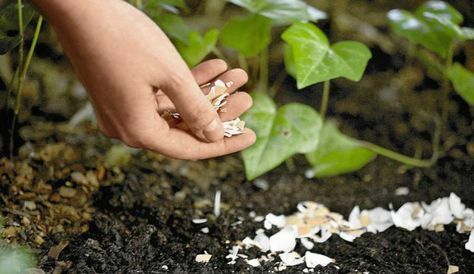 One great way to get calcium in your soil AND reduce your home waste is to take your eggshells and grind them into the soil. Just put them in a baggie, smash them up real good, and then layer them around your plants. 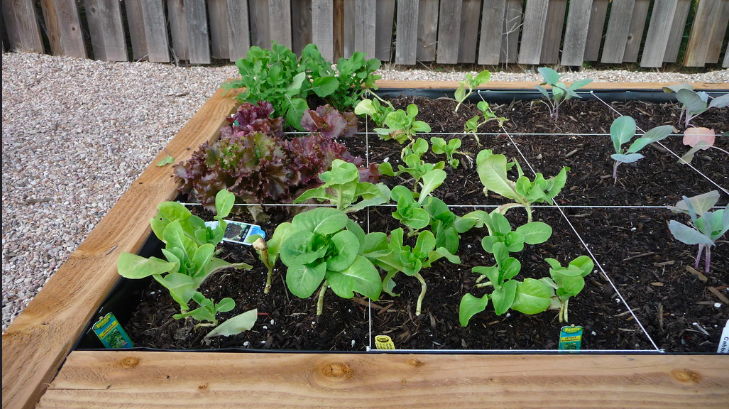 This will also help reduce pests like snails and slugs. If you like annuals that have shorter blooming seasons, consider installing a larger pot in your soil and popping those smaller pots of flowers in and out throughout the season. 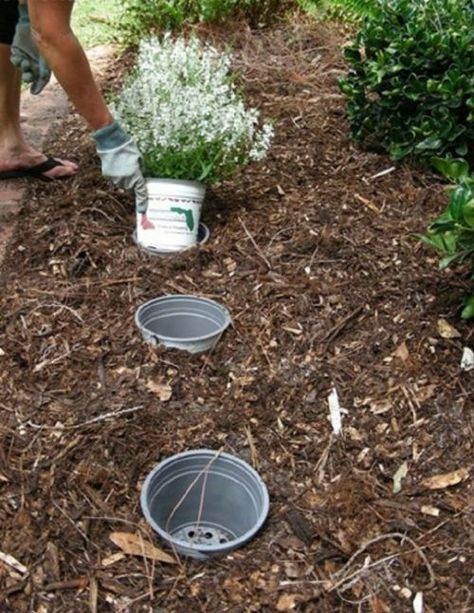 This will also help you keep plants that have invasive properties and like to spread from taking over your garden. Just make sure the pots have proper drainage. Your neighbors will wonder how you manage to re-landscape throughout the growing season. First of all, keep in mind that Epsom salt is NOT salt, it’s a compound called magnesium sulfate (so no salting your plants if you don’t have Epsom salt on hand!). If you’re having a hard time getting a good crop of tomatoes, try using the Epsom salt trick to up their magnesium. 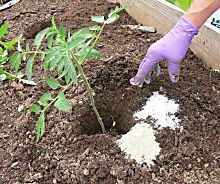 There are a couple of ways to use it: 1) sprinkle it over the plot of land where you plan to plant your tomatoes (about 1 cup per 100 sq ft), then work it into the soil, and pop in your seedlings; 2) work Epsom salt into the soil throughout the growing season (1 tablespoon per foot of plant height) every two weeks; 3) spray the foliage to give your plants a boost every two weeks using 1 or 2 tablespoons in a gallon of water. If you have potted tomato plants, you can water them once a month with an Epsom salt solution of 2 tablespoons per gallon of water. Pro tip: Peppers and roses also like extra magnesium. If you do some container gardening, consider taking any extra packing peanuts that show up with your packages and put them in the bottom of your pots. This will keep your containers nice and light and moveable (have you tried to lift a large pot full of dirt?! ), save you some money, and provide good drainage for your plants. Weeds are a fact of life, but that doesn’t mean you can’t try to keep things neat and tidy in your garden. One quick fix that doesn’t cost a fortune, add toxic chemicals to your soil, or wreak havoc on your back and shoulders is simple vinegar. 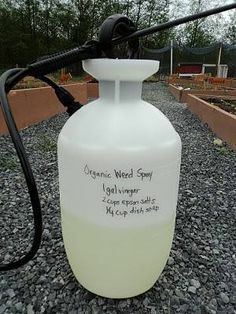 Believe it or not, if you fill a spray bottle with simple white vinegar and drench the little guys (trying not to drench your precious wanted plants) they’ll die off at the root. Once that happens, they’ll be easy to pluck right out without much effort. However, there have been warnings recently about going overboard with the vinegar in your garden. Once people see it working they tend to want to use higher concentrations of vinegar and those can cause damage to skin and to soil. So stick to the household stuff. You can also create a more complex concoction with 1 gallon of vinegar, 2 cups of Epsom salts, and 1/4 cup of dish soap (it just depends how you feel about dish soap in your soil). Stay sustainable by setting aside any water you’ve used to boil eggs or vegetables to fertilize your plants. The water will be high in nutrients to keep your garden green and healthy. Just make sure you cool it down first. Vegetable gardens are beautiful in their own right, but if you want to look outside and admire the beautiful colors of spring and summer, try planting flowers alongside your edible crops. What you can plant will vary by your location (or “zone”), but take a look at things like petunias and zinnias that have a long blooming season. 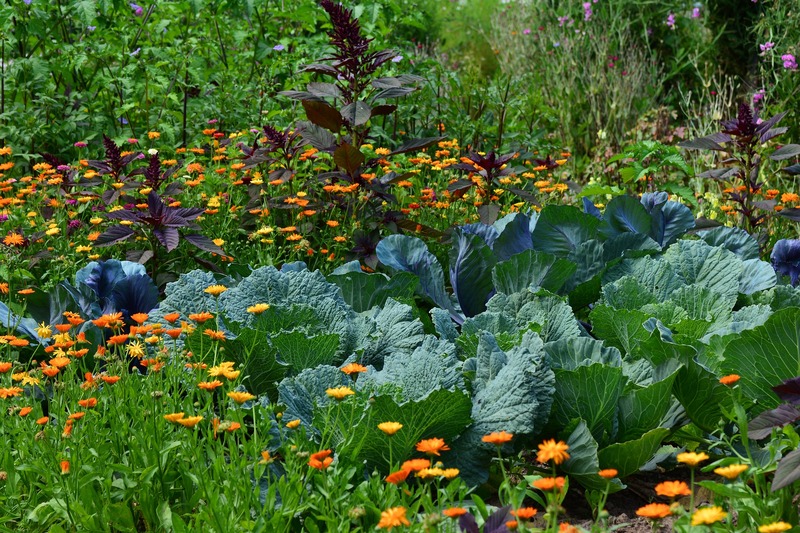 Other flowers like calendula, chamomile, nasturtium, and marigolds are especially great for vegetable gardens. Like your tomatoes on the sweet side? 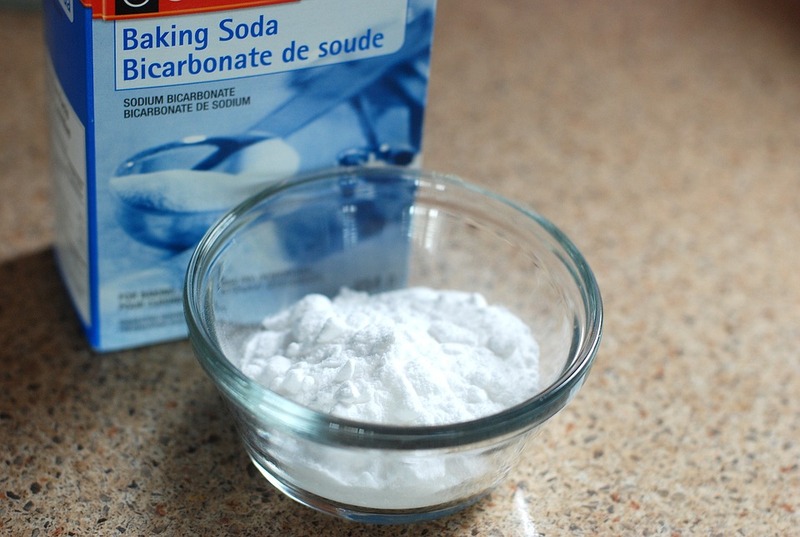 Simply sprinkle some baking soda on the soil around your plants. 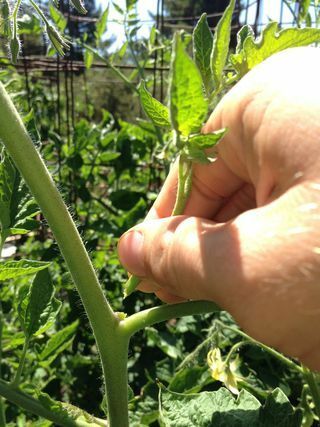 While the acidity of tomatoes is mostly genetic – making your choice of what to plant the most important part of getting a sweeter tomato – some gardeners still swear by the baking soda trick to lower the acidity of the soil, so it might be worth a try. Just don’t put it right on the plant. It’s great to have a natural alternative to chemical pesticides, especially if you’re growing produce to consume. Granted, the chemicals are often a lot more effective, but there can be health trade-offs. Now, using canola oil on pests might sound a bit gruesome because it works by poisoning them or blocking their air holes until they suffocate, but it’s not any different than spraying them with a chemical. To make a pest-killing spray, combine 1 cup of canola oil and 1 tablespoon of mild liquid dish soap. This is your concentrated base. Take 1 or 2 teaspoons of this mixture when you notice an infestation and add it to a spray bottle containing 1 cup of water. Shake it up and spray directly on the intruders. Do this on a dry day when it’s not too hot and humid so it can evaporate. 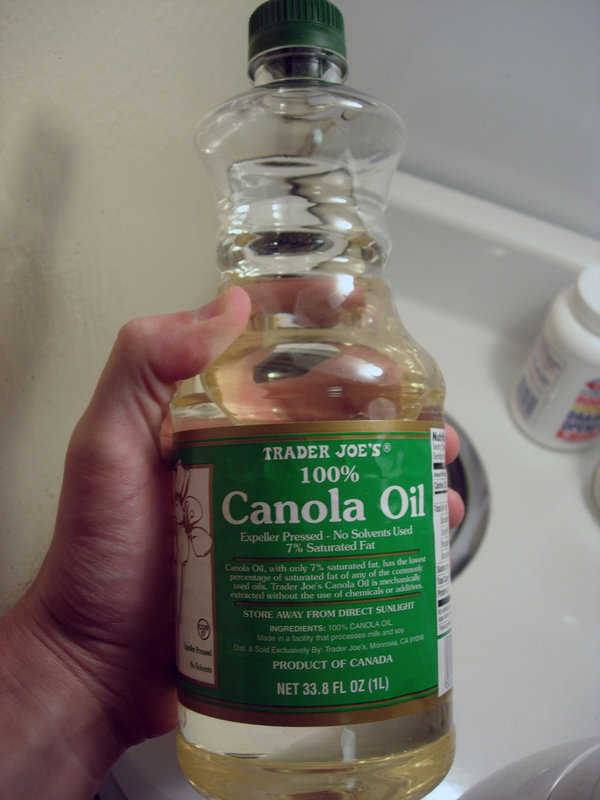 While you can spray the leaves of most garden plants with canola oil, some trees can be negatively affected by oils, so be sure to check first if you’re going to use this trick on them. Tiny pests aren’t the only thing that can get into your garden. Pets and other wildlife like to walk through your hard work, dig around, and chew on your bounty. Since you probably want to enjoy your beautiful plants without having to build a big wall around them, consider sticking some pointy(ish) objects in the ground to deter animals. 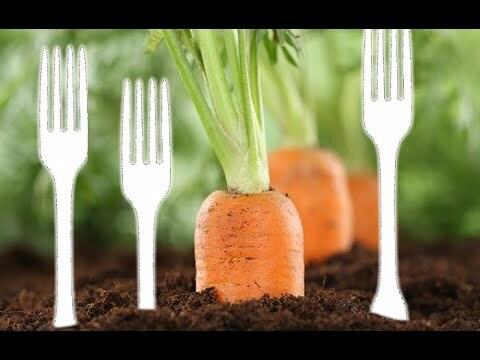 Some people use plastic forks (which can only do so much damage and won’t impale a living creature) which can be unsightly, but you can buy them in various colors (including black) to help them blend in. Plants that are native to your area are always going to grow better than ones that come from far away. Your area almost certainly has a gardeners group or other resources that list native plants (and they are likely available at local greenhouses in larger quantities than other plants). While many vegetable plants have been modified to grow in a variety of locations, you can still do your part to maintain your local ecosystem by surrounding your garden with native wildflowers or grasses. Because they’re uniquely suited to the environment, they’re less likely to need extra attention, water, or fertilizer. 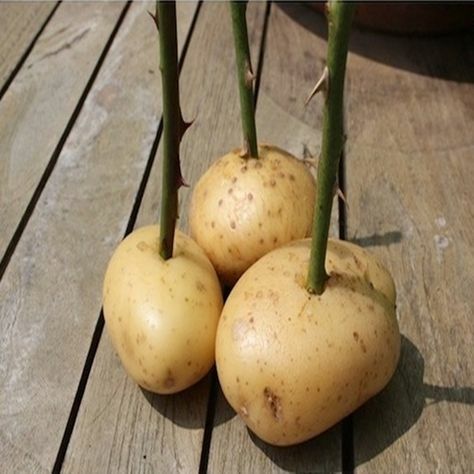 So here’s one we’ve never heard of – apparently you can trim a branch from a rose bush, pop it into a potato, and plant it in the ground to grow a new rose bush. The potato helps the new bush retain the moisture it needs to grow and will biodegrade in the ground as your new roses bloom. You’ll need at least an 8-inch trimming to get a good start. Be sure to bury about 2/3 of the stalk. Before you invest in new plants, keep track of how much sun and shade the area you’ve set aside to plant them gets throughout the day. 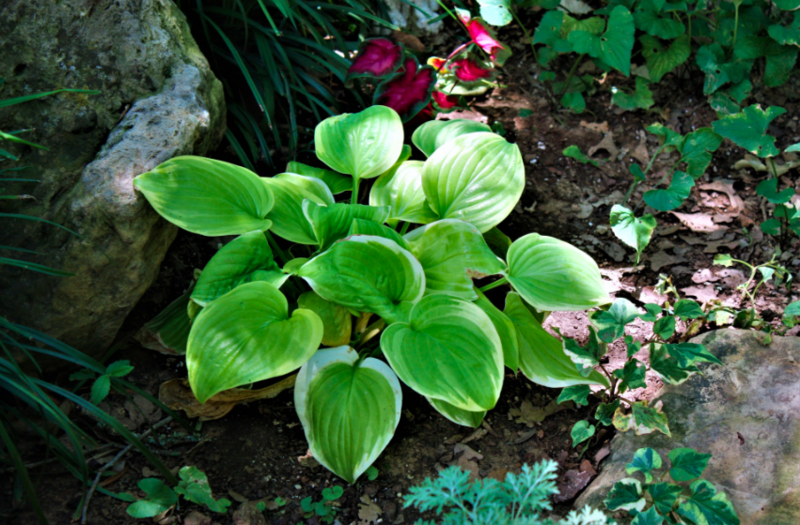 Some plants thrive in shade and will wilt in the sun no matter how well you treat them. Likewise, for those that need direct sunlight – all the fertilizer and loving attention in the world won’t make a difference if you’ve planted them in a shady place. This information is available on seed packets and the little tags attached to plants at your local garden center. And if you’re not sure, you can always ask. It might be tougher at big box stores where employees aren’t necessarily knowledgeable about what they’re selling, but you never know. And you can always look it up online before you shell out cash for something that just won’t grow where you need it to. There’s no need to break the bank on posh garden gear (unless you want to), but having the right tools will make life much easier. 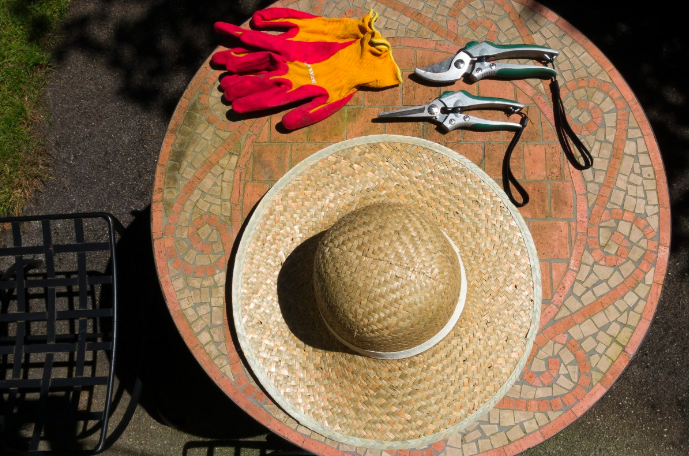 Good gloves are a must (dirt under your nails might be a sign of hard work, but it’s also a potential health hazard) along with a trowel, spade, a good watering can, and pruners (scissors often don’t give you the sharp cut you need). And you’ll likely thank yourself later when everyone else is complaining about the pain in their neck and shoulders if you invest in something soft to kneel on or a moveable bench to sit on while you work at the beginning of the season. It’s hard to enjoy your garden if you’re in pain! 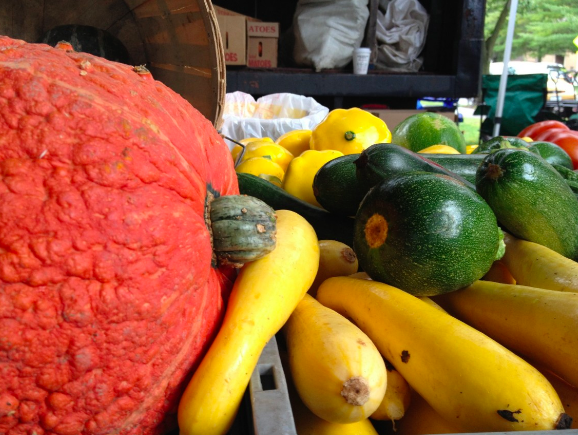 If you want a big yield from a small plant, consider something in the squash family. While you need to be careful because they can grow quickly and get out of control (sometimes strangling other plants), the reward can be great with relatively little effort. If you’re growing them from seeds, you need to start early, but seedlings and larger plants can go in the ground later. The great thing about squash is that it produces from mid-summer through the fall season, so the yield can be enormous if you take care of your plants. Just keep in mind that they do take up lots of room, so set aside the appropriate amount of space. There are a ton of varieties to choose from, depending on your tastes. Plants rely on pollinators for reproduction and if you want to invite the ones you won’t be tempted to swat at to your garden, consider planting some flowers that attract butterflies. 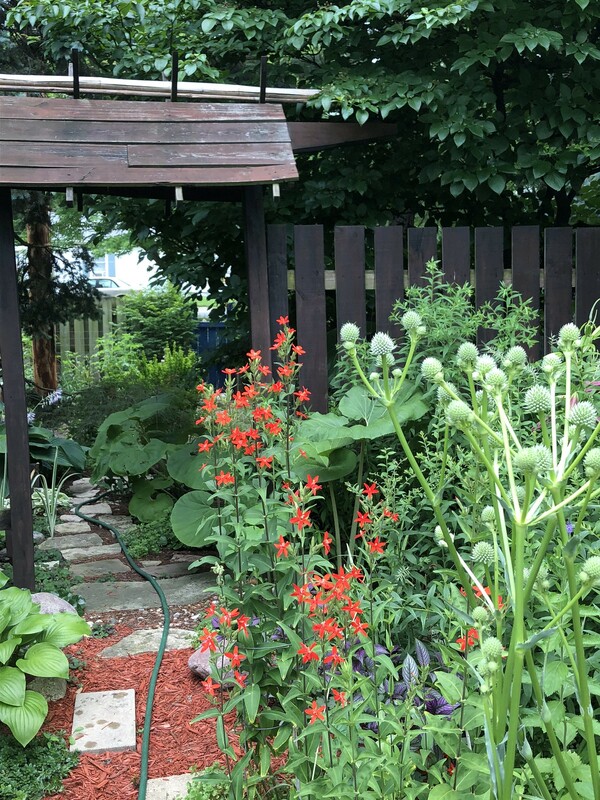 Globe thistle, goldenrod, hollyhock, lavender, milkweed, and willow are all good choices and might attract hummingbirds as well. 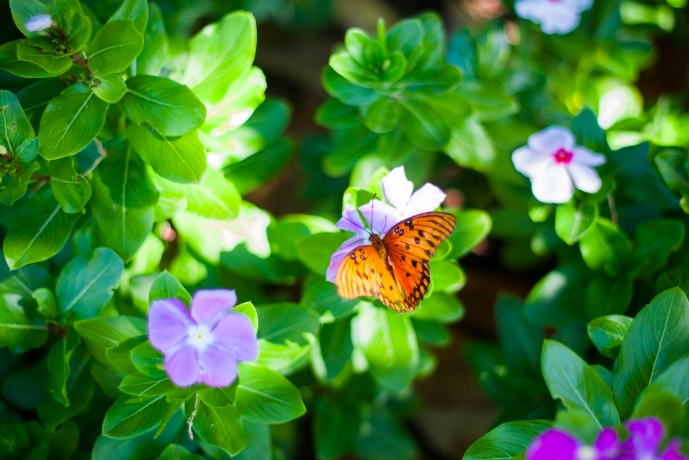 Butterflies also tend to be attracted to brightly colored and fragrant flowers as well as native species. While butterflies in their larval stage do feed on your plants in a way that can cause some minimal damage, the payoff is often worth it. 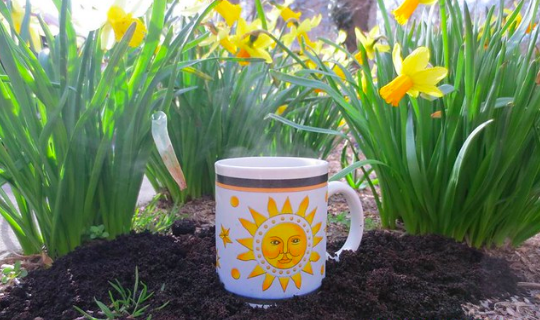 If you enjoy a cup of coffee in the morning, take those leftover grounds out to the garden instead of dumping them in the trash. The grounds help aerate your soil, promote water retention and proper drainage, and boost your nitrogen content. Just work the grounds into the soil (don’t spread a big blanket of it on top of soil) and you’ll attract earthworms as well, which are nature’s original garden tillers. Just make sure to limit this trick to acid-loving plants like hydrangeas, rhododendrons, azaleas, blueberries, carrots, and radishes. Keep them away from the tomatoes. 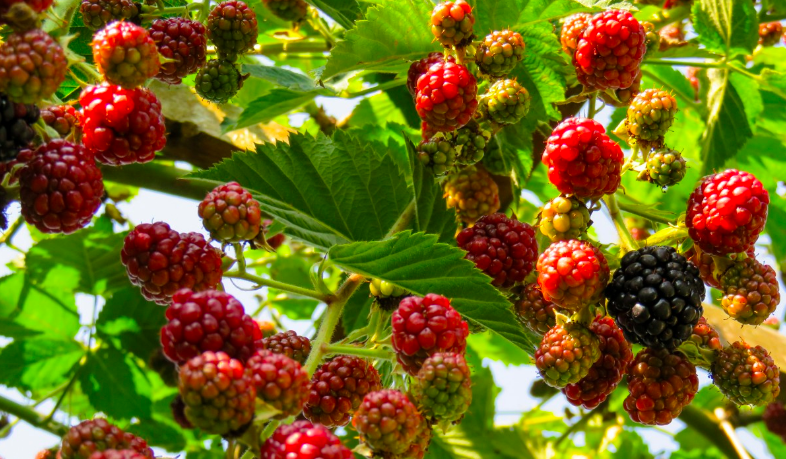 Whether you like your fruit straight from the garden or baked into a pie, fruit plants make a great choice if you want a colorful garden and have an area that gets lots of sunlight. You’ll have to be careful to plant things like raspberries and blueberries in the place you intend to keep them though since they’ll spring up every year. 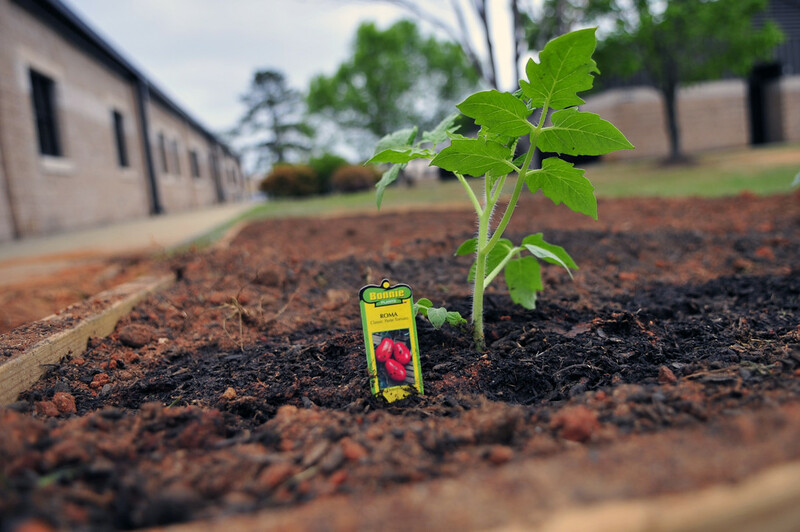 Some fruits need to be planted at the beginning of spring while others can wait until later in the season, so be sure to check the tags on plants to maximize your chances of success. Even if you keep your grass mowed and your sidewalks tidy, edging your lawn really gives it a professionally manicured look. And if you’re building a garden, getting those nice straight lines in the grass makes it look like you really know what you’re doing. 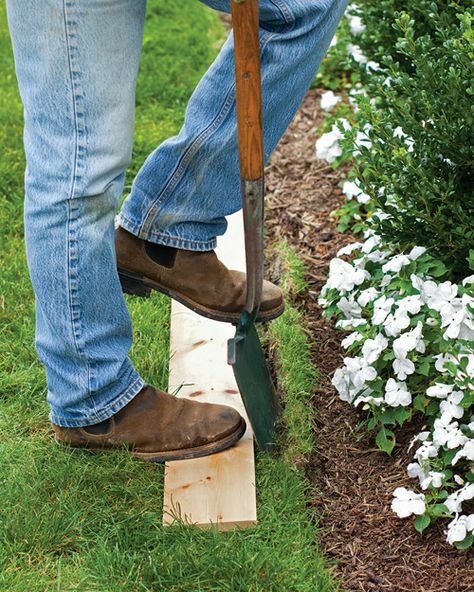 Next time you need to do some edging, grab a 2×4 (or better yet – and safer for your toes – a 2×6) piece of wood and drive the spade into the ground along the edge. If you have dense foliage in your yard and it needs fertilizing, it can be hard to get the fertilizer down into the soil where you need it. 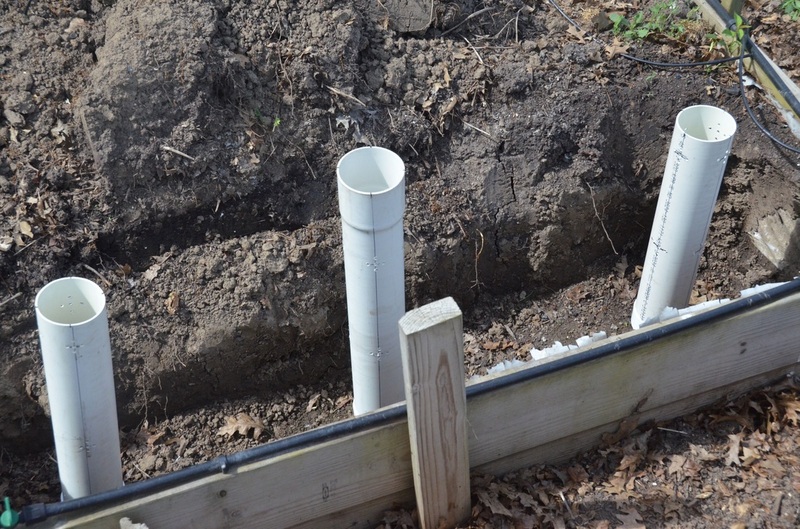 Try using a 2″ PVC pipe and stick it down through the leaves. Then pour the fertilizer in so it slides down where you need it. Use a funnel for extra caution and less mess. Vining plants are beautiful, but getting them to grow in the right direction can be tricky. 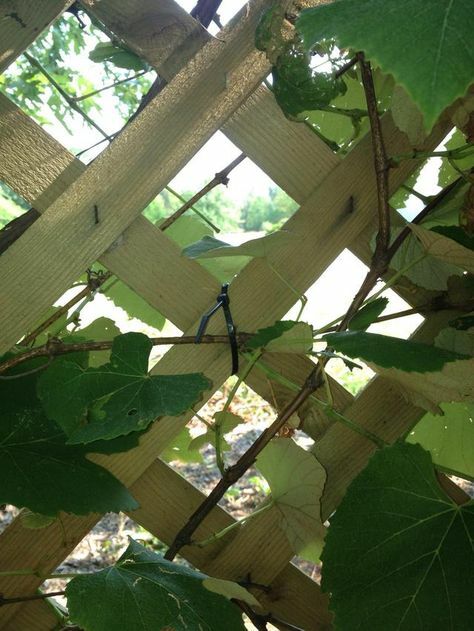 Try using zip ties or twist ties from trash bags to direct the vines. Just make sure you don’t fasten them too tight because they need to be able to move around a bit. 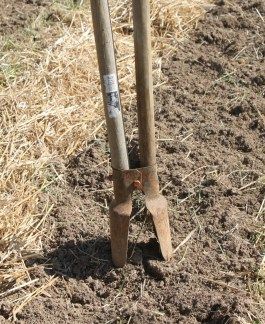 Save yourself the aches and pains next time you have vegetables to plant by grabbing a post hole digger instead of a trowel. This will let you get as deep into the ground as you need to while allowing you to stay standing for the hard part. It’s always a pain when a new plant has grown some roots through the bottom holes of its pot. Next time this happens, don’t try to yank it out and damage those hearty roots. Instead, simply cut down the side of the plastic container and slide it out. You may have to cut along the bottom as well if it’s really stuck in there, but just add some heavy-duty scissors to your gardening tool kit and you’ll be ready to go next time you’re in a bind. If you want strong and hearty tomato plants, prune wisely. Snip the side shoots (or suckers) that form during growth and your chosen shoots will get all the resources they need to grow thick and strong and hold up your bounty without too much drooping. Cats like to chew and urinate on plants, neither of which is good for them. 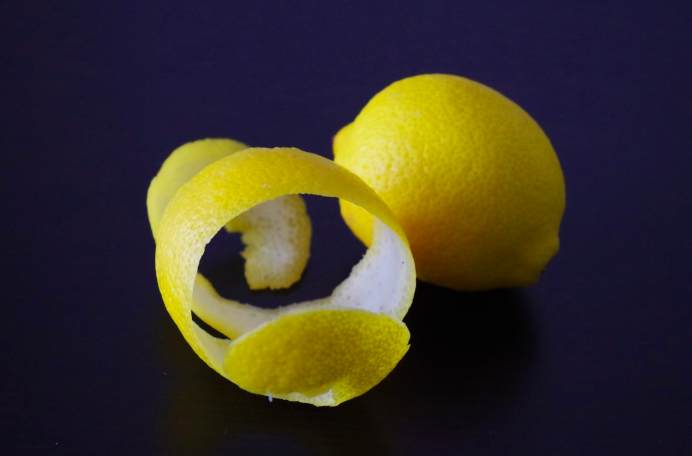 If you have outdoor cats (or neighborhood visitors) that you’d like to gently discourage from using your garden as a litter box, try putting some orange or lemon peel around. Cats hate citrus – and you can always use the rest to garnish your cocktail! If you’re ambitious enough to plant your garden from seeds, try soaking them first. It’s an old farming/gardening trick that’ll be the easiest part of the task. Simply pop your seeds into some warm water for up to 24 hours before planting them in the soil. Just be sure not to let them dry out before you get them in the ground. If you want more control over your soil (especially if you have sandy soil on your property), consider building a raised bed. Cinder blocks, wood beams, and other decorative materials can be used to build four walls of any height to create your garden. 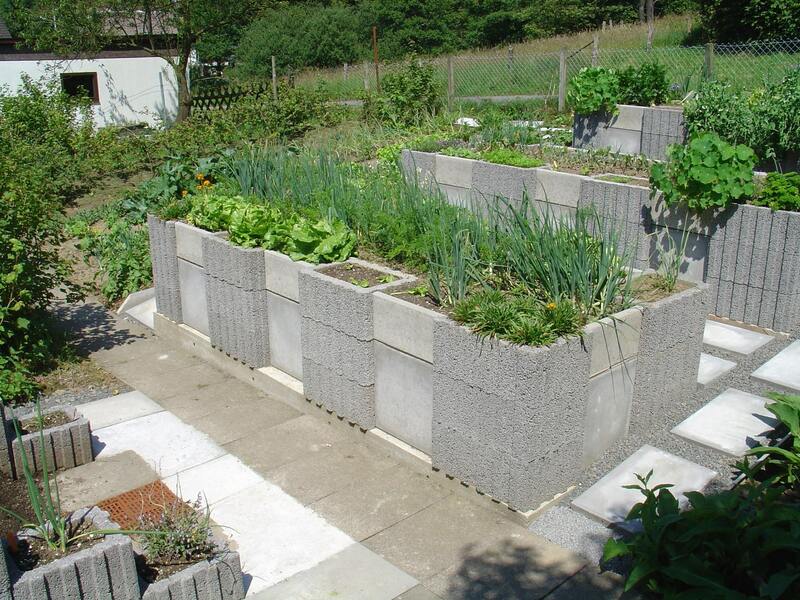 Cinder blocks, while not the most glamorous option, are also useful for separating different plants within your garden as well. And better yet, they’re cheap! Many ceramic pots have a large hole in the bottom for drainage. 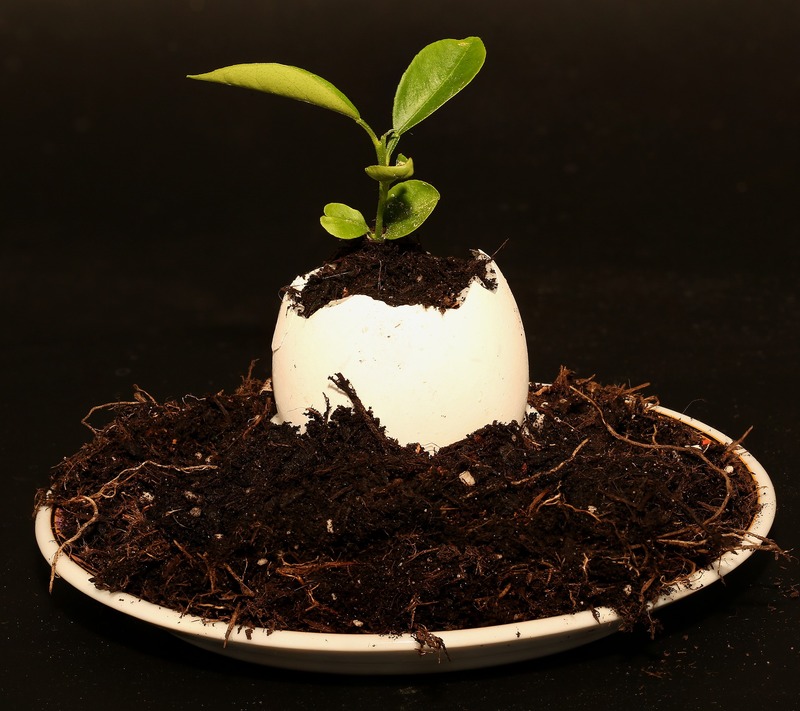 But more often than not, it’s also an escape hatch for dirt as well, which can be especially annoying when you’re potting something for the first time. 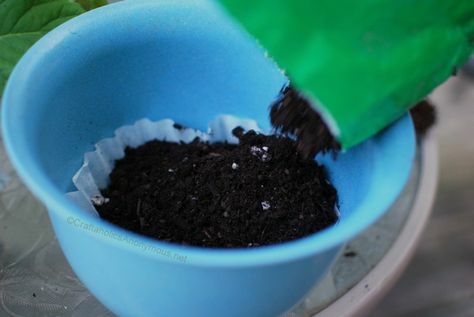 An easy fix is to simply add a coffee filter to the bottom to keep the dirt in. You’ll still have drainage but won’t have to worry about sweeping up after your done potting your plant. 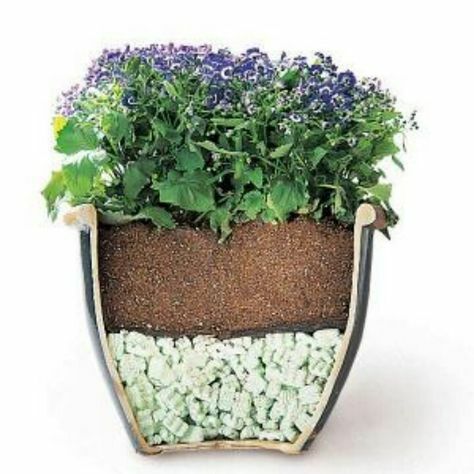 Those black plastic containers that your flowers come in make a great well to help water your plants’ roots. 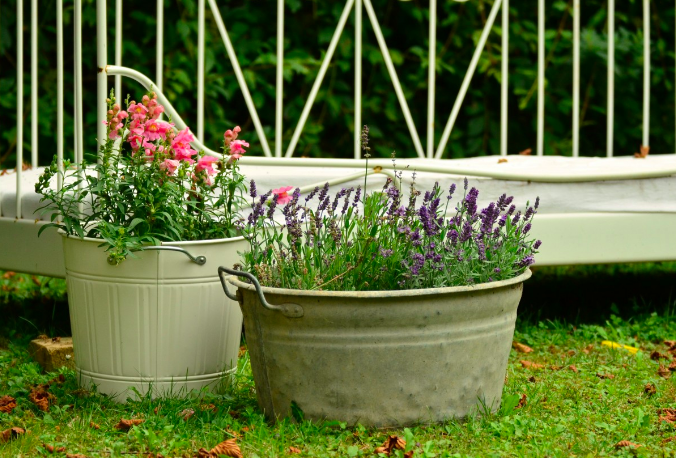 Simply place your plants or seeds around the pot and fill it up when you’re watering your flowers. The holes in the bottom will let out water at a much deeper level, ensuring that water gets to your roots for maximum uptake. 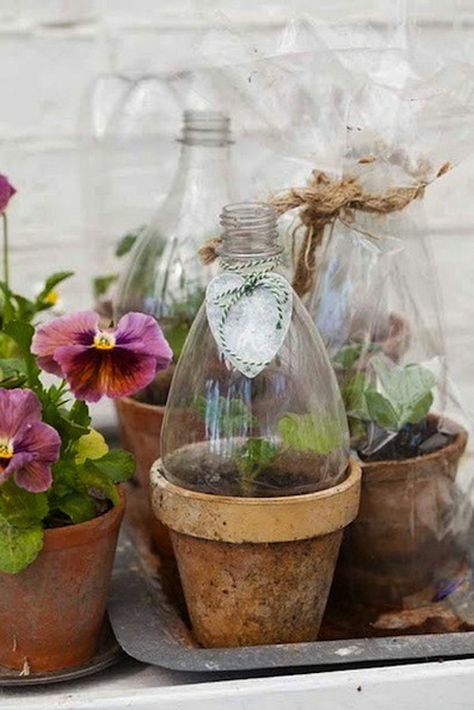 Not only is this an adorable and sustainable idea, but the calcium in eggshells will give your seedlings the boost they need to grow healthy and strong. 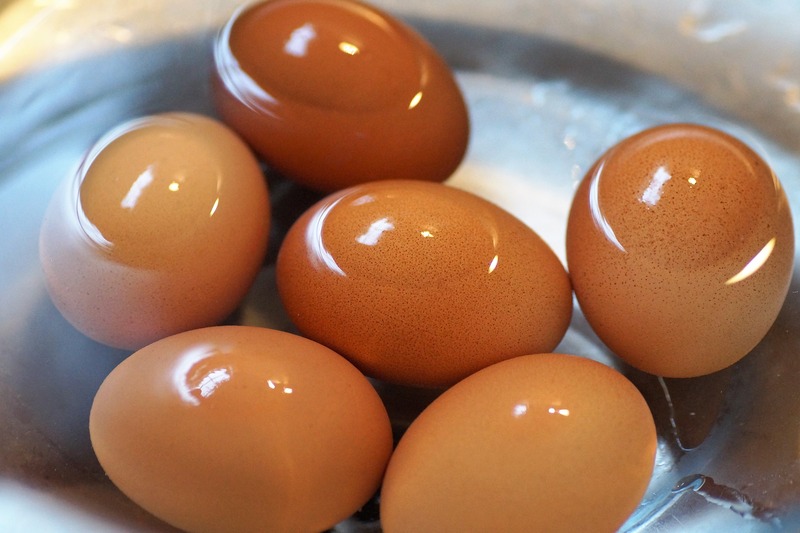 Once they’re ready to be planted, you can pop the egg right in the ground since it will split apart and degrade. If you’ve started your seedlings inside but don’t have the right moisture conditions, try cutting off the top of a clear plastic soda bottle and using it as a dome to seal in warmth and moisture. 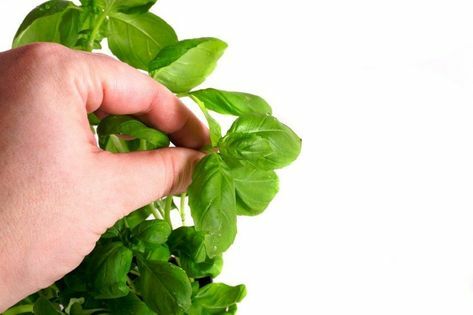 Pinching off your herbs is the best way to harvest the leaves while encouraging new growth from the lower dormant buds. Just be sure to pinch it at the little knob right where the leaf meets the stem. Your plants will also look lusher instead of tall and stringy with this trick. It’s tough to get the dirt out from under your nails, so why not prevent it altogether? Grab some bar soap and scrape your fingernails along it before heading outside. 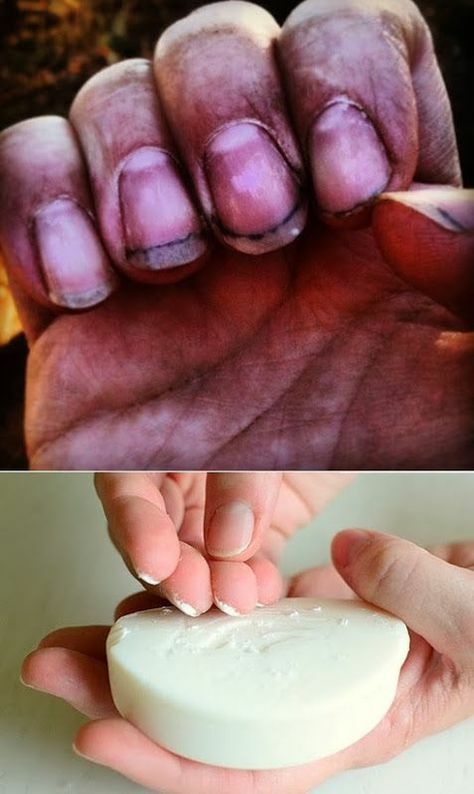 Allow the soap to stay there while your hands are hard at work and you won’t need a new manicure later on. If you soak your seeds overnight, go ahead and toss the ones that float to the top. 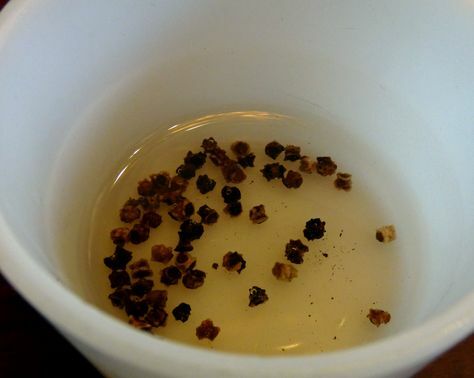 Even if you don’t have hours to soak your seeds, stick them in a glass of water first, especially if they are a bit older and you want to see how viable they are before you plant them. The ones that float are usually past their prime. The pH of your soil matters a great deal if you want your plants to reach their full potential. Some plants like acidic soil, while others like alkaline (and some, like hydrangeas, will grow differently depending on the pH of the soil – that’s why you might buy a bush with blue flowers that turn pink the next year!). You can buy a pH testing kit at the store, but if you want a simple hack, just grab some vinegar, baking soda, and distilled water from your pantry. You won’t get a specific pH reading, but this will let you know if you have alkaline, acidic, or neutral soil. Just take about 1/4 cup of dirt, mix it with distilled water, and begin to slowly pour vinegar over the top. If it fizzes, it’s alkaline. Now do that same again with a new sample, but instead of vinegar, sprinkle baking soda over your cup of mud. If it bubbles in this case, it’s acidic. 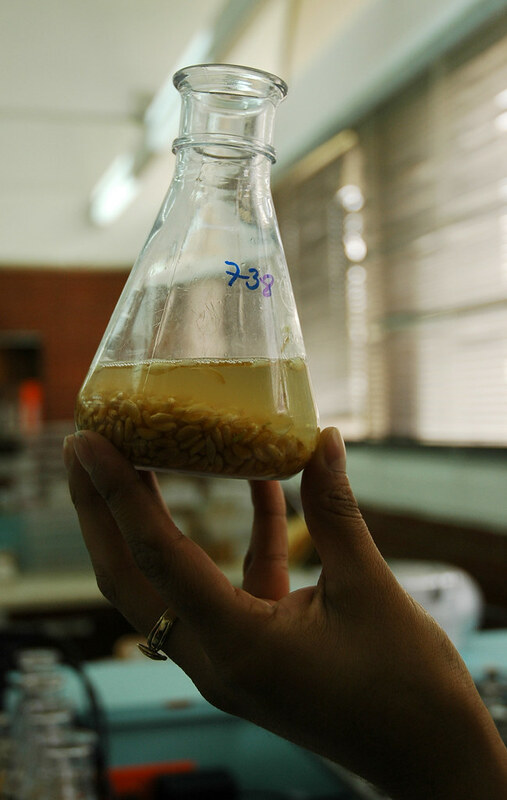 If nothing happens with either experiment, you have neutral soil.